The DrugNews Center is the largest source for prescription drug and medical device warnings, research and legal news. Visit http://www.DrugNews.net today. Hospitals such as the Cleveland Clinic have halted the morcellation procedures. The women’s health advocates at DrugNews.net are alerting women who have undergone laparoscopic hysterectomy or fibroid removal surgery with morcellation procedures of new information on the site. Experts have warned some patients may suffer acceleration of undetected uterine sarcoma from the procedure*. DrugNews is a free resource providing the latest product recalls, safety alerts, research and litigation news for patients undergoing treatment with popular medical devices. Visitors can recognize potential dangers, see if others are experiencing similar side effects and decide if they need legal advice. The resource center has added warnings from health experts such as the FDA* and Society of Gynecological Oncology** that laparoscopic hysterectomies and myomectomies performed using morcellation may significantly accelerate cancer in some patients. Morcellation is a procedure used in minimally invasive laparoscopic surgeries that cuts the uterus or fibroids into small pieces before removal***. The FDA has warned that 1 in 350 women undergoing these surgeries may have undetected uterine sarcoma which can be spread*. 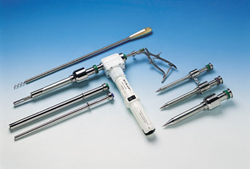 Hospitals such as the Cleveland Clinic have halted the morcellation procedures**** and Johnson & Johnson, who sells around 75% of all morcellator devices, has stopped sales***. DrugNews has learned the first morcellation lawsuit was filed in March by a man who alleged his 53 year old wife died from uterine cancer after undergoing a morcellation hysterectomy*****. Lawyers are helping those affected. Anyone diagnosed with uterine cancer after undergoing a laparoscopic hysterectomy or fibroid removal is encouraged to visit DrugNews or speak with a lawyer about their legal options. DrugNews only recommends lawyers who have already handled hysterectomy cancer lawsuits. For more information on the research, side effects and litigation news related to morcellation and laparoscopic hysterectomies, or to speak with a lawyer, visit http://www.DrugNews.net.